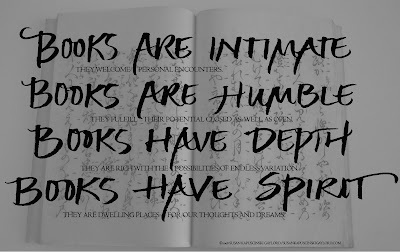 Books are intimate; they welcome personal encounters. Books are humble; they fulfill their potential closed as well as open. Books have depth; they are rich with the possibilities of endless variation. Books have spirit; they are dwelling places for our thoughts and dreams. I wrote a version of this in my early years of making books and for a long time it was on the entry page to my art website. Over the years I have seen it pop up here and there as an anonymous poem. Here is a pdf version of Books are intimate.